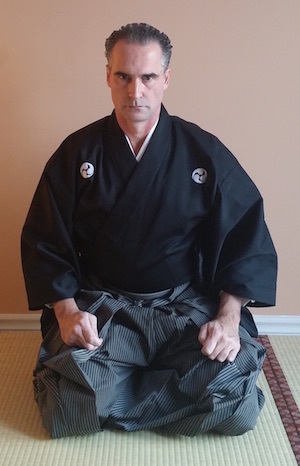 It is with great happiness that The International Budo Institute announces that Sensei Michael Coleman has been promoted to 4th Dan in Shorinjiryu Kenkokan Karatedo by So Shihan Masayuki Hisataka. The ceremony was completed at the Hombu Dojo in Tokyo were Sensei Coleman trains on a regular basis. 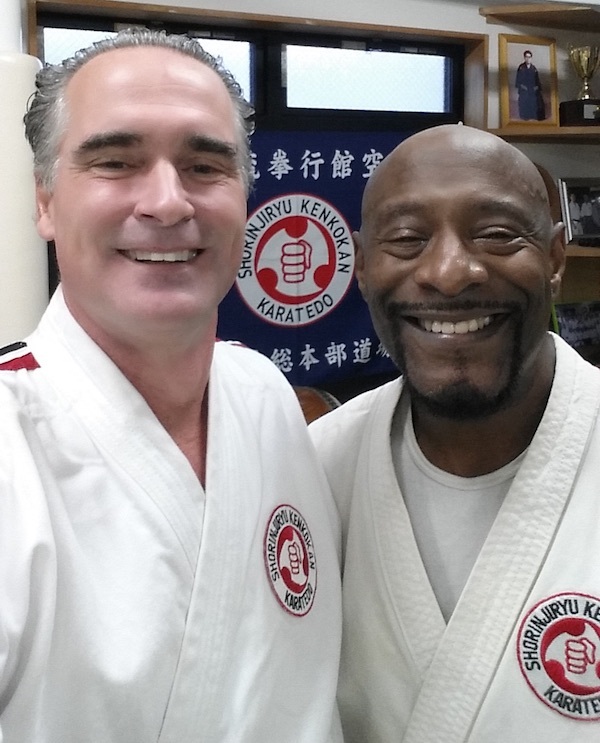 Below Sensei Coleman is seen with Shihan Henderson at the Hombu. It is with great pleasure that The International Budo Institute announces that Sensei Paul Stewart has joined as Instructor of Kendo. 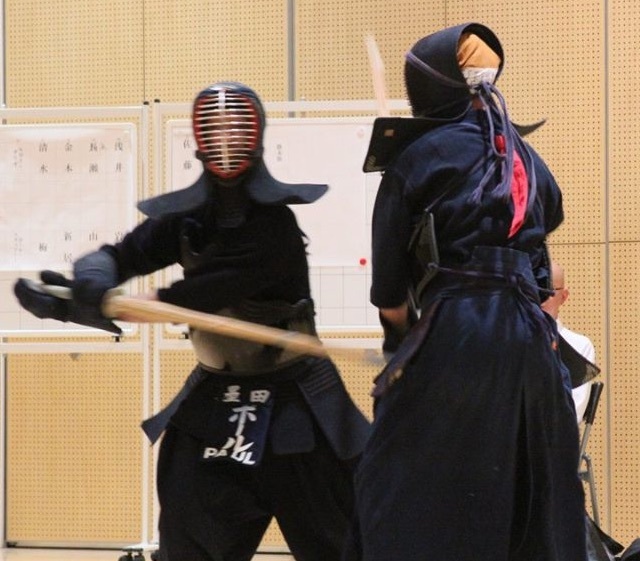 Sensei Paul is a member of Sumida ku Renmei in Tokyo and has reached 2nd dan in Kendo (2017) and the same year 1st dan in Iaido in the Seitei style of the All Japan Kendo Federation, while also being introduced to Muso Shinden-Ryu. 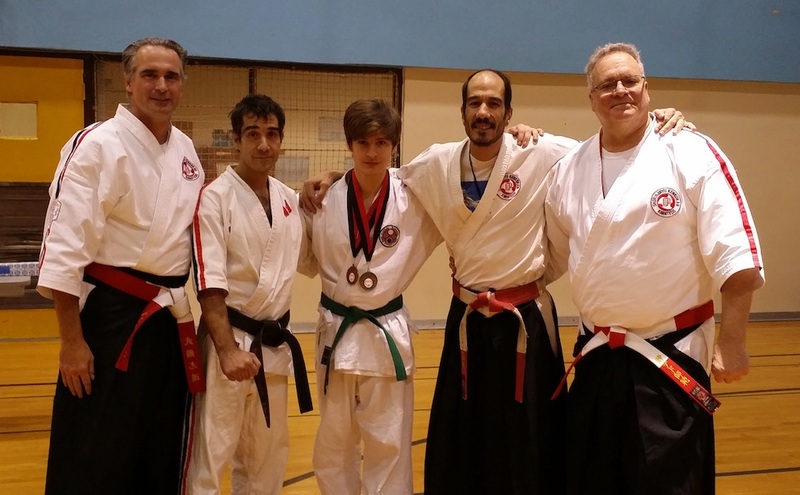 He trains regularly with local Sensei and is very much a part of the budo community of the area participating in tournaments and gatherings. 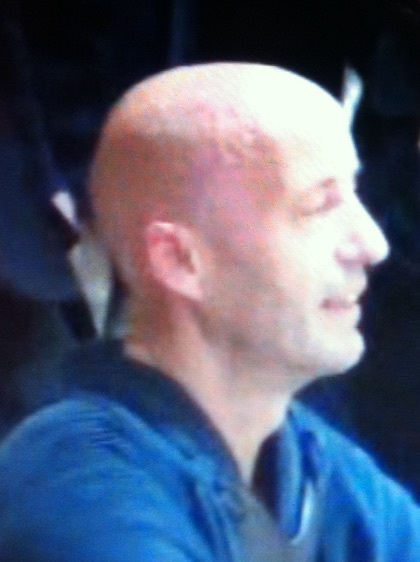 Sensei Paul holds a Diploma in Sports Studies from Otago University, New Zealand. He has invested in various ongoing opportunities particularly related to the field of conscious awareness and deliberate creating. With a wealth of rich experience, Paul enjoys the freedom of choosing a perspective, trusting one’s true nature and of course, being one’s self. Sensei Paul is an active writer and speaker. 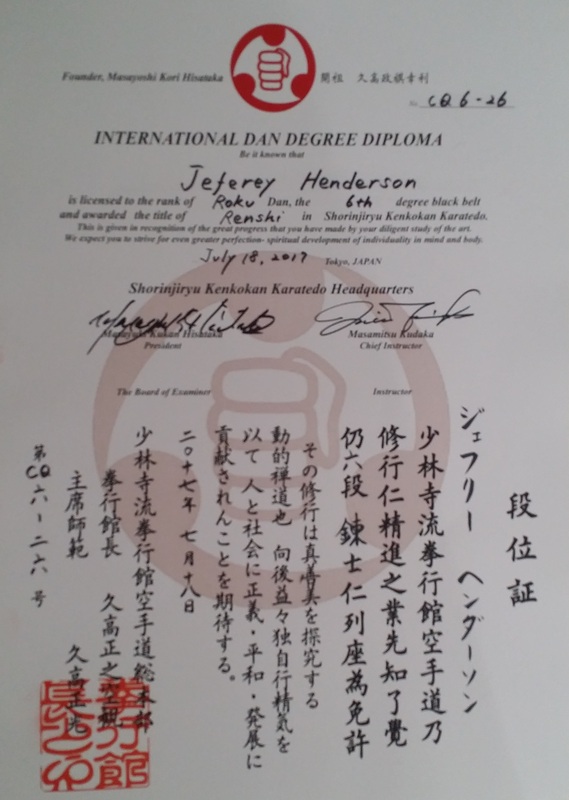 It is with great honor that The International Budo Institute Announce that Shihan Dr. Jeffrey Henderson was awarded 6th Dan in Shorinjiryu Kenkokan Karatedo from So Shihan Masayuki Kudaka at the London International Koshiki Tournament held in London, Ontario in July, 2017. Shihan Henderson was presented along with Shihan Paul Jackman of Ken Nin Kai, the host of the tournament. If you are interested in sword art. Kuroda Sensei is one of the best! Today’s training started at 5:10 am after going to bed at 2 am due to New Year’s festivities. Even with the lack of proper sleep training was good as the resolution for greater commitment towards training for 2017 was at hand. In the martial arts we have the terms “Shugyo” and “Ningen Shugyo”. Shugyo refers to “austere daily training” while Ningen Shugyo refers to intense personal study or training. We see with the two terms that there is a slight difference in whether or not the training is personally directed but we can also say that the terms are interrelated and cross over. The major point is that the training remains sincere and is why the word austere is often used. The term “austere” can refer to a few different concepts, being: strict, severe, no comfort, and simple in appearance. Often martial arts Shugyo training focuses solely on the severe side of the definition. And this is an error. Perhaps it has to do with the nature of martial arts or the type of personalities that are attracted to the martial arts. Whatever the case may be an undue focus on severe training can be detrimental and should be avoided. It can be detrimental because it sets the practitioner up for failure by design. It also sets the mind around the concept that something good or a preferred state of being can only result from pain and personal torture. And though this might have some basis or truth in the various mysticisms found in the world the approach is misplaced within the martial arts. The correct view of “Shugyo” should focus on the concepts of “no comfort” [i.e. : absence of luxury], “simple in appearance” and “strict” while keeping the “severe” training to a minimum. First, we must understand that we have to remove our ego from training if we truly wish to make personal gains, especially spiritual gains. By having an undue focus on overly intense, painful and severe training we are basically doing the exact opposite. When we train with a severe mindset we are placing our ego and all its baggage at the very center of our training. We set up a conflict between our present self and some future ideal that is based on passing through some form of torture. The entire process is based on pain and conflict. Ask yourself if anything truly beneficial can come of this. More likely than not the practitioner will at some point simply give up the sadomasochistic behavior and move on to other things. Otherwise said, it does not matter if the punishment being inflicted upon you is done so by an outside party or by yourself, it is still punishment. From a motivational theory standpoint we know that punishment can change behavior over the short-term but it does not have lasting long-term benefit and the chances that the old behavior (lack of daily training) will return is high. This is because the motivation is based on external forces. What we need in our personal daily training is reinforcement. Reinforcement can come from an external party, such as a Sensei, or internally from ourselves. It is preferred that the reinforcement comes from an internally generated source which is the point of this entry. By focusing our daily training around “no comfort”, “simple in appearance” and “strict” while leaving out the “severe” you remove your ego and any sense of punishment from your training regime. Your daily training will thus be internally generated and focused on the essentials. You will strive for simplicity in the execution of your techniques, you will exercise determination and be strict with your training schedule and finally you will develop a countenance of simplicity that others will appreciate. Simplicity can only be nurtured by removing baggage and stripping away the unnecessary. The thought that martial arts training has to be painful and severe is a Hollywood creation. Martial arts training needs to be dedicated, honest and sincere. It pushes the martial artist out of their comfort zone and encourages breakthroughs from a position of strength. If it is solely based on pain and severity it is ultimately a weak type of training and a true love for the martial arts, your Budo, can not develop. As a result you will always feel unfulfilled and unworthy. So, do not confuse pain and torture with true Budo training. Developing the character and spirit means developing a steadfast sense of determination, being strict with your schedule and plans and always approaching your training with a high level of sincerity that you are doing your very best. This is the way to finding a true love for Budo, a love and dedication that will be able to weather any storm. And this is the ultimate goal of Shugyo! Training started today at 6 am. I felt good and I can feel my body adjusting to the early morning timetable. Near completion of the 21st repetition of Sochin kata I decided to add an extra #22 and that next practice will be 25 and building onwards so that day 21 will be 40 katas in total in preparation for Teaching #3. It is important to always push yourself to getter heights in your training. Do not wait for your teacher or someone else to ask or suggest it, make a decision to grow. When I was studying my Master degree in The Netherlands the dutch teachers taught us many very valuable lessons. Dutch culture and society is relatively small but their culture has had a disproportionate effect on world history. They were masters of the seas and of commerce, one of the first hegemonies in the world. The dutch teachers taught me an invaluable lesson that “making a decision” is not the same as “taking a decision”. This might sound trifle at first until you notice in life and in business that many people make a whole host of decisions every day, but few of these same people put those decisions in to practice. Putting decisions in to practice (i.e. : taking a decision) is where the expertise and determination of the person comes in to play. Now, we may not always have the expertise we need to effectively put a decision in to practice. If you are young and you decide that you want to be a black belt then you have made a decision. But having the courage to go to a dojo or find a teacher and begin training is where the real test lies. Taking the decision and not merely making the decision is the key. But you must recognize that your skill set is lacking to effectively become a black belt. This is why your teacher or guide is there. The teacher, or Sensei, is there to help you to acquire the necessary skill set so that you can take your decision to be a black belt. But it is immensely important to understand that they can not take the decision for you. Only you can do that. They can only assist you once you have taken the decision and start to act. Often, I see students both in the martial arts and in academics falter and they often blame others for their failure. One of my Budo Sensei used to say that when you are looking for an excuse any excuse will do. And isn’t it so. Procrastination is one thing but insecurity is another. Procrastination often means that the person is lazy but not incapable. Insecurity often is at the root of the problem as to why many students make a decision but seem not able to take the decision. They are afraid of the consequences of not achieving their intended goal and so to avoid embarrassment they choose not to even start. This is bad thinking. So many inventors tried hundreds of times before their invention proved possible. The light bulb by Edison is one such well-known example. We must keep in mind the saying, “Touch the moon for reaching for the stars”. And the thought here is that by trying you will achieve. Even if you do not achieve your intended goal you will achieve something. And the benefit of that achievement might only show itself later in time. So make a decision for change, take that decision (put it into practice) and reach the moon through continuous improvement. All Budoka understand and appreciate the importance of not just making decisions but putting decisions into practice. Budoka are action-oriented individuals who provide example to the world of their determination for continual improvement through action. Kata is action-based meditation and self-development. Achieving the intended goal is secondary, cultivating an attitude of ceaseless self-improvement and continuous striving for greater personal development through action is really the important inner trait of every Budoka. I had the feeling today that there is nothing special about any day of training. That is, when you train everyday each day is the same as the other. The 1,000 day of training is the same as the 10th day. Unremarkable. Of course, there are all the different issues we face but training is training. Another thought which came to mind is that a student remarked that the 1,000 day training was impossible. But when you think about when you were a child you would run outside every morning and spend hours with your friends exploring. No one ever said you had to do 1,000 days of exploring. You just loved to explore and to be with your friends playing. So maybe the issue is not that 1,000 mornings of training is possible or not possible, or hard or not hard, but rather that we do not love our training. If we truly loved our training 1,000 mornings in a row would be the accomplishment of a child. The International Budo Institute would like to congratulate its student David Migneault for having placed 3rd in Kata and 2nd in Lightweight Shiai at the recent 2016 Canadian Koshiki Tournament held in Toronto Canada on December 10th, 2016. 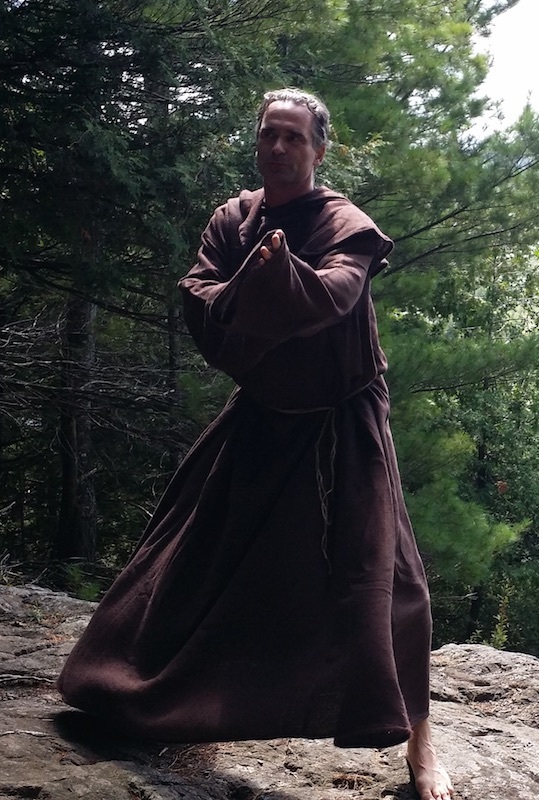 The determination and perseverance that is shown by the Marathon Monks lends inspiration to all martial artists and shows that we can always strive for something greater beyond our present limitations. Mount Hiei is located next to Kyoto, Japan and is a spiritual center of great importance.